FILE - Saudi women shop at a mall in Riyadh, Saudi Arabia, Dec. 11, 2015. Human rights groups have for years criticized Saudi Arabia for its treatment of women. The most recent U.S. State Department report on human rights said "persuasive gender discrimination and lack of equal rights" affected "all aspects of women's lives. But some women visiting Washington as part of a Saudi delegation point to some progress and insist that more change is on the horizon. “Women have gone through transformation all around the world, including the United States, where [at one time] they could not vote or run in the Boston Marathon. We (Saudi society) are evolving and we have come a long way, as now women are part of the Shura (Consultative Assembly of Saudi Arabia). It was unthinkable in the past. Change is a process and it is coming to Saudi Arabia,” said Lina Almaeena, founder and CEO of Jeddah United Sports Company, in an interview with VOA. Women in Saudi Arabia face many restrictions, including not being allowed to go outside their homes without a male family member or guardian. In a landmark moment last December, women won municipal council seats in the first vote open to female voters and candidates. “Women should have a greater participation in public life and the restriction to leave their house only with a male member really restricts their mobility and participation,” Keiswetter told VOA. He also said the opportunity to go to coeducational institutions will increase women’s chances of getting ahead in the field of education and empower them in the society. But women are empowered enough in Saudi Arabia to advise the government, says Thourayya Alarryed, a member of parliament. “The reports of all ministries that should go to the ministers, and then to the King, come to us. We read these reports carefully and see whether we agree with what they ask for. The decision of the King is based on what we advise,” Alarryed told VOA. In 2013, for the first time in the country’s history, women were appointed to be members of the Shura Council. Alarryed is one of the 30 women in the 150-member parliament. Some experts think the debate about Saudi Arabia remains too focused on women's issues, and a more important point is the need to introduce less restrictive practices for the entire society, including its male members. 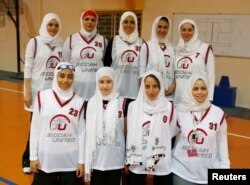 FILE - Saudi Arabia's Jeddah United pose before their friendly basketball game against Jordan's Al Reyadeh in Amman, April 21, 2009. “Both Saudi women and men reside in a country with deep and powerful social constraints. Given this cultural restriction, the opportunities for women are impressive. It is up to Saudi women to decide how to respond in the future to this culture and influence their government in this regard,” wrote Dr. Janet Breslin-Smith in response to a set of questions by VOA. She is the former chair, department of national security strategy, National War College and resided in Saudi Arabia from 2009 to 2013 when her husband was U.S. ambassador to the kingdom. She is now president of Crosswinds Strategic Consulting. Education is considered a key factor in enabling a society to meet the challenges of the contemporary world. In Breslin-Smith’s view, the focus of the Saudi leadership is misplaced. What is also missing from Saudi society is open debate and a vibrant media, say other analysts. Breslin-Smith also supported the idea of allowing the society to have the opportunity to have an open discussion and debate.